Work in the European Parliament’s eighth term ends on 18 April 2019. In a direct vote on 23-26 May, citizens in 27 EU member states will elect 705 MEPs to form the new House. 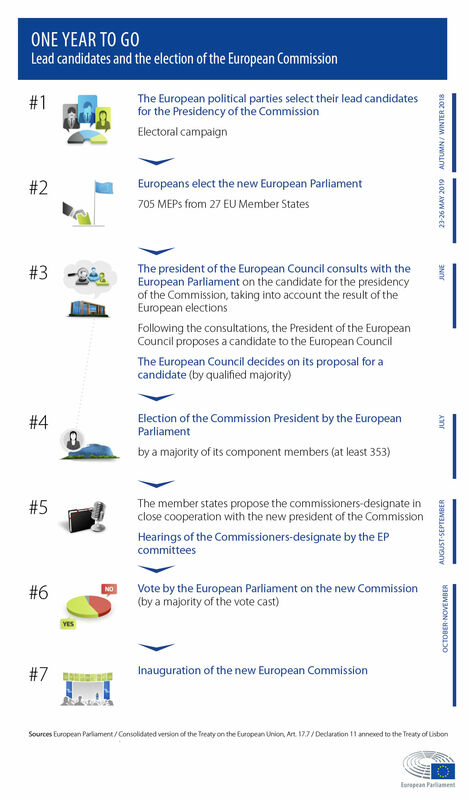 In the coming 12 months and 16 plenary sessions, Parliament in its current form (751 MEPs from 28 member states) will debate and vote on many crucial legislative proposals, including the EU’s next long-term budget and the UK’s “Brexit” withdrawal agreement (more on past and upcoming decisions below). MEPs’ “Future of Europe” debates with EU leaders are set to attract growing public attention as the election campaigns get under way. At the invitation of Parliament’s President Antonio Tajani, EU heads of state or government will continue debating their visions of Europe’s future with MEPs and EU Commission President Jean-Claude Juncker during plenary sessions. Past contributions by Mark Rutte(Netherlands), Xavier Bettel (Luxembourg), Charles Michel (Belgium), Emmanuel Macron(France), António Costa (Portugal), Andrej Plenković (Croatia) and Leo Varadkar (Ireland) will be followed by debates with Mateusz Morawiecki (Poland), Alexis Tsipras (Greece), Jüri Ratas (Estonia), Klaus Iohannis (Romania), Angela Merkel (Germany), Lars Løkke Rasmussen (Denmark) and Pédro Sanchez (Spain). At the September 2018 plenary session, Jean-Claude Juncker, who became President of the European Commission after his party won most seats in 2014 European elections, will deliver his last “State of the Union” (SOTEU) speech and defend his political legacy in a debate on the outgoing Commission’s work, attended by all Commissioners. Read more on the assessment of the Commission’s performance to date. The EU Commission negotiating team and the UK government are expected to conclude the Brexit negotiations in the autumn. The European Parliament will need to approve the agreement by a simple majority of votes cast (article 50 (2) of the Treaty). For this reason it is closely informed of the proceedings, even if it has no formal role in the negociations. Britain’s membership of the European Union is set to lapse as of 29 March 2019. Read more about Parliament’s debates and resolutions online on Brexit. People between 16 and 30 years old held the first pan-European citizens’ debate on the future of Europe, in Strasbourg on 1 and 2 June, as part of the 2018 “European Youth Event” (EYE2018), hosted by Parliament but run by young people for young people. In some 400 activities, workshops and idea-labs, more than 8,000 young people from all parts of Europe and the world expressed their view and expectations. Read more. The EYE2018 report will wrap up the debates and its most striking ideas will be presented by their proponents in special youth hearings in parliamentary committees before the end of the year. Parliament’s services will use both traditional and digital campaign tools to inform European citizens about past achievements and the challenges ahead, to allow for informed debate on what makes the EU valuable to them and where it needs change to deliver benefits for all – on local, regional, national and cross-border levels. A non-partisan platform “This time I’m voting.eu” has been set up continue the debate and motivate more people to get involved, get informed and make their voices heard during the European elections in May 2019. Parliament’s communication services, in particular its liaison offices in all member states, will act as information hubs tailored to local needs. They will support public debate by offering local platforms, easy-to-access online tools, seminars and information material (such as an application on the impact of EU legislation in each and every region, available at the end of 2018). Quick-response services such as Ask EP, FAQ, #EUandME (by the European Commission) are available in all languages. For contact details, check Multimedia content and services. Throughout the next 12 months, Parliament will also deliver further Eurobarometer surveysof public opinion (planned in May, October, March) monitoring citizens’ expectations, common trends and national differences. In the run-up to the elections, polls on voting intentions in the EU27 will be published bi-monthly and then weekly during the last month before the vote. CETA: MEPs back EU-Canada trade agreement, Parliament backs EU directive on use of Passenger Name Records (PNR), MEPs clamp down on wasteful use of plastic carrier bags, Opening up the online payments market, so as to reduce fees and fraud risks, MEPs’ green light for Paris climate agreement to trigger its entry into force, MEPs put an end to opaque card payment fees, End of roaming: final hurdle cleared, WiFi4EU: New EU scheme for free internet access, Data protection reform – Parliament approves new rules fit for the digital era, Climate change: MEPs back plans to help forests remove CO2, Online shopping: “geo-blocking” to end in December 2018, Corporate governance: MEPs vote to enforce tax transparency. Go to the Press Service News section to learn more on ongoing and past parliamentary debates and votes.